One property lost power and The Broyle between Ringmer and Halland was closed until 7pm yesterday (Wednesday December 10) after a two-car collision brought down power cables. 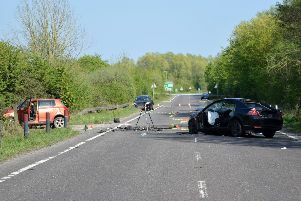 Police said the crash happened at about 6am near Ringmer. One of the cars, driven by a 27-year-old Lewes man, sheared through a pole carrying the cables before ending up in a ditch. The other vehicle was driven by a 49-year-old man from East Dean, who was accompanied by a 46-year-old passenger from Eastbourne. There were no serious injuries. UK Power Networks said the accident cut off the supply at one property and their power was restored by 1pm. UK Power Networks engineers completed repairs as quickly as possible and the temporary traffic lights were removed by 7pm. Anyone who saw what happened is asked to email the police at collision.appeal@sussex.pnn.police.uk or phone 101, quoting serial 163 of 10/12.